- Increased availability of Free Coins rewarded videos. - Fixed issue with status bar showing during gameplay. NOTE: We are always reading your feedback on how we can improve our games for future updates. As we are unable to respond here, we will always welcome you to come and talk to us at support@distinctivegames.com, our Facebook page (facebook.com/distinctivegames) or on twitter @distinctivegame. Our aim is to make the best possible games so we would love to hear from you! With over 30 million downloads and counting! The number one soccer game on mobile, Football Kicks is all about mastering your free kicks, through blood, sweat and tears on the pitch. Football Kicks is back with a brand new look! New and improved visuals give the game a brand new look and feel, really capturing the essence of the beautiful sport. 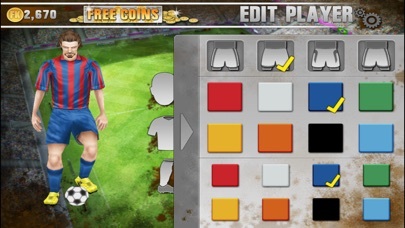 Pick a match from six Soccer crazy game modes from Beat the Wall to Win the Euros and swipe your way to victory. 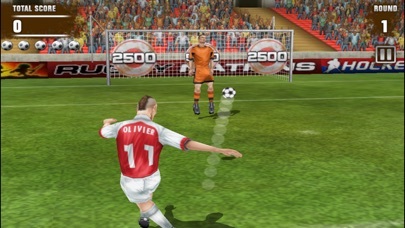 Feel the pressure of live Soccer in Sudden Death, and score as many goals as you can in Beat the Clock. Play like Ronaldo against Beat the Goalie and make sure you’re on target with Cross the Ball all the while earn Football Kicks coins as you play. Spend your wages on exclusive Soccer mascots, amazing stadiums and even personalize your player to look like soccer hero Messi, or who-ever you like! Just swipe to shoot, you’ll be a worldcup winner in no time! WANT THE LATEST ON ALL THINGS FOOTBALL KICKS? Bending the ball is sooo fun and realistic. I'm having a lot of fun playing it. A must have game for football lover.